You start the game with an empty board. There are flowers falling in twos from the top of it. You may decide where they will land by moving the flowers horizontally and rotating them during the flight. You can see the next plant in the bottom right corner of the screen. If there's no more room for new flowers on the board, the game is over. The goal of the game is to clear all the flowers away from the board, therefore you have to join the plants together in single-colour groups of four or more. When you remove enough flowers (you can see its number on the left of the screen), you will pass to the next level. There are five levels in the game. Appear in five different colours. Join them in bigger groups, horizontal as well as vertical. They cannot be clear until they have been woken up. To wake a sleeping flower up you have to clear a flower lying next to it or ask Mr. Green for help. Is a friendly gardener with good intentions that can help you. He will clear away all flowers of the same colour as the flower he lands on top of. Likes to observe plant life from a close distance. He is very annoying as he cannot be removed by traditional way. Only Mr. Green knows how to clear him away. Flowers in falling pairs are not linked together. If they fall horizontally and stop on columns of different heights, they split up. A group which is already formed may also split up, when flowers below are removed. 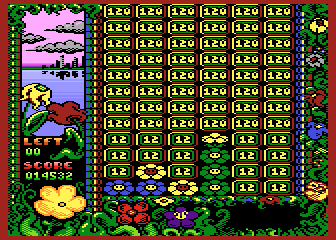 The game ends, when you remove all flowers on all three levels or when there's no more space for new pair of plants. To pass on, you have to remove not only common flowers, but also Dr. Red. There's no time limit. You may change flowers position as long as they don't reach the bottom of the board or already existing column. You can move them horizontally or rotate them. Mr. Green is excellent in dangerous situations and as an impulse for successful series of removings. However, if you aren't enough cautious, he may destroy your carefully planned arrangement of flowers. If you don't need him, rather place him in an empty column. You may also benefit from skilful arrangement of sleeping flowers. They may prevent too fast removing groups you are building. Wake them up when you are ready. You may gain better score using this 3-level combo: on 3 flowers of given colour, lay flowers of different colour, and on that flowers, put two or three buds of the first colour. Then remove the flowers from the middle, making new removable combination. Both versions of the game are available here. Original version of the manual from atari.online.pl: here.